Submitted by witness on Monday, May 1, 2017. LOCATION DETAILS: Specific directions omitted upon the family's request. OBSERVED: We live in Michigan near a national forest. One evening my 2 18 year old daughters and I took my pick up down a two track looking for rocks for our fire pit we were building. It was light out with a light rain. We were coming up over a ridge on the trail and when we were starting down a huge bigfoot ran across the trail in front of us. We all saw it well. It was covered in long black hair with a patch of white hair along its back near its shoulder. Its was running with amazing speed in a forward leaning position and its arms seemed to almost touch the ground as it ran we figured it to be approximately 9 foot tall. We could clearly see legs arms hands head muscle definition throughout its body even with long hair. The hair on its back and body was longer than the hair on its head and arms. We didnt get to see its face tho.but the strangest part of this was that it was running with a gray colored wolf that I've seen multiple times before. It really appeared that they were together..The wolf was at full stride about 15 feet behind it .Once it cleared the track it went up the hill on the other side with an amazing speed. It seemed to pull away from the wolf at the last little bit we watched it. We tried to drive to where they last were to try and see them again but they were gone. That wolf was ran very close to me on my 4 wheeler and I can tell you he is no little puppy. He leaves an almost 5 1/2 inch track and the bigfoot dwarfed the wolf. The next day I went back to look for prints but the 14 hours of heavy rain over night ruined and prints there might have been. We have found several other 4 toed very large prints in the area. 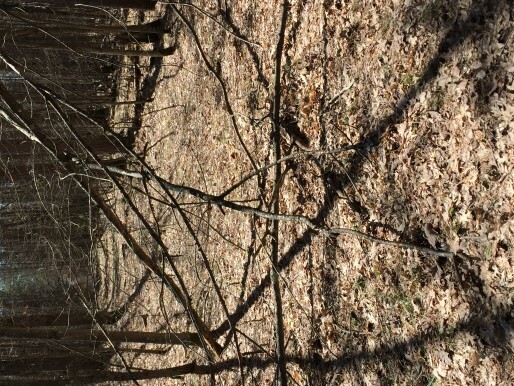 A local bf researcher came out to investigate the area and was impressed with what is called tree structures. 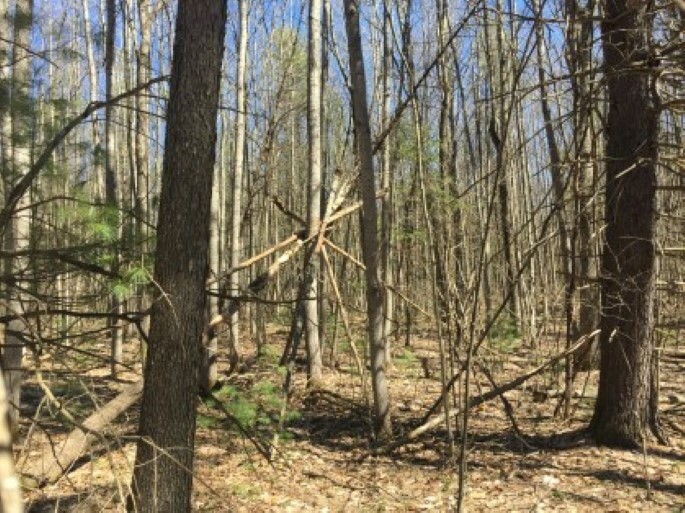 There was are a couple found like a teepee style and one is very large but the trees are upside down. Weird! I have pictures of the things we have found and are happy to share all my evidence we have found to help others know these things are real and they exist here in Michigan. ALSO NOTICED: The speed at which it was able to move was just amazing and the wolf running with it like a pet was very strange. We have heard loud roaring sounds in those woods many times with many different people over the last few months since deer season. And I've found prints in the snow that I've recorded with 4 toes. Two different size 4 toed prints were found crossing a sandy trail in the morning. I took pics of those also. OTHER WITNESSES: Yes my 18 year old twin daughters. We were riding in the pickup looking straight ahead down the trail when it crossed We all saw it very well . OTHER STORIES: 2 men live out in that forest in a house with no electricity. They both have claimed to see a bigfoot .one was very close to our incident. And one of the men says hes heard the roaring call like sound from time to time and a tarzan / monky sound behind his house from time to time. He literally lives around almost no one the majority of the year. TIME AND CONDITIONS: Evening about 745pm iit was light out with a slight rain. ENVIRONMENT: This is a forest area state owned.where there are swampy areas with dense pine all around. The witness has had several encounters, I will document each encounter in separate statements, in an attempt to avoid confusion. 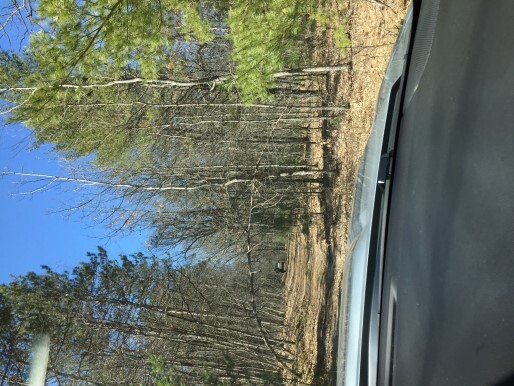 The first area is northwest of Higgins Lake in Roscommon county, there are few actual roads within this area, most "roads" are two-tracks used by those vacationing in the area for fun or by hunters during a seasonal hunting period, those off road trails form a checkerboard pattern throughout this area. This checkerboard consists of open farmland, blocks of woods, patches of scrub brush dotting the area and the occasional open area that has a pumpjack. There are small creeks, a few 1 acre lakes, some patches of swamp and a few seasonal wetlands. Though US-127 is nearby, once you get a few hundred yards into the area, the only indications of civilization is the two-track trails that outline the checkboard and the occasional pumpjack. Glaciers shaped the area. A large portion of the area is the so-called Grayling outwash plain, which consists of broad outwash plain including sandy ice-disintegration ridges; jack pine barrens, some white pine-red pine forest, and northern hardwood forest. Large lakes were created by glacial action. 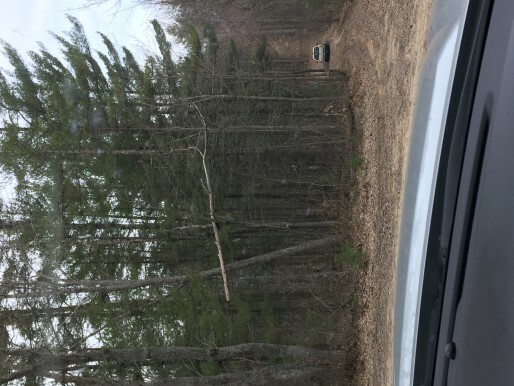 The area the witness had one of his encounters is wooded with ash, birch and pines; while the terrain is mostly rolling hills, with wetlands and the occasional kettle dotting the landscape, on one of the two-tracks previously noted that form the checkboard pattern. There are no major power corridors located nearby, but north of the encounter is what appears to be the outlines of a former creek/stream/river. The witness also noted that directly behind the creature was a large wolf that appeared to be keeping pace with the creature and that he felt the wolf wasn't chasing the creature, but was running with it. The witness stated that he has seen a wolf in that area of the woods on more than one occasions= and that the one behind the creature looked very much the same as the previous one which had left a paw print around 5-1/2". The witness estimated that if the creature stood up, it would be around 9' tall, he also noted that the hair on the back and body appeared longer than the hair on its head and arms. My initial contact with the witness was at his residence, he invited us in and we began discussing the area, his experience and approximately where it was located. He and one of his daughters hopped in his truck and we followed him to the area of the first experience. It took some time to get there, the two-tracks are not easily traversed by mere cars, 4-wheel drive was required that day. Along the way, we took numerous photos of interesting tree structures. The first spot he took us to was a location that he and the family routinely camp at, a 20' x 40' indent into the brush off one of the two-tracks. 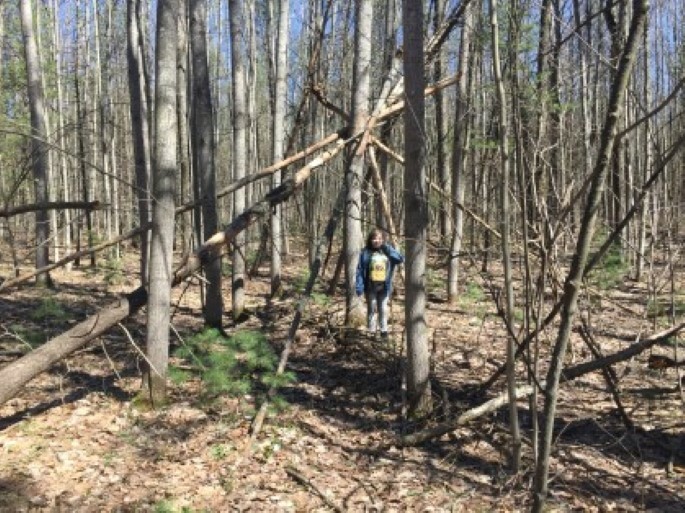 He showed us a fairly large stick structure nearby, which appeared to be at least 15' tall, there is also a smaller (mini-me) versions right next to it, and we also noticed that there are a lot of arches in the surrounding woods. Now they could be from snow load, or not; I am just noting that there are dozens and dozens of them around in the woods. 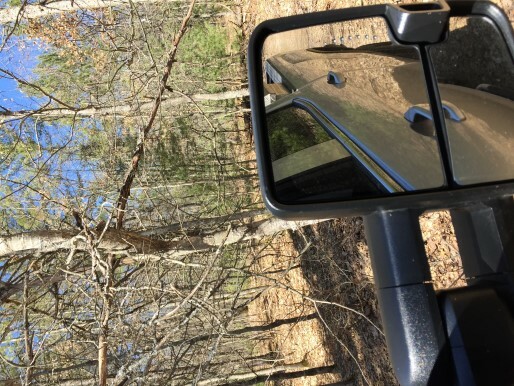 We also found a ORV trail that had branches, limbs and a tree leaning over it blocking access down it, not saying its anything but interesting. We also encountered something that the witness drove past, but I found very interesting, so I stopped to look at it and take some pictures. 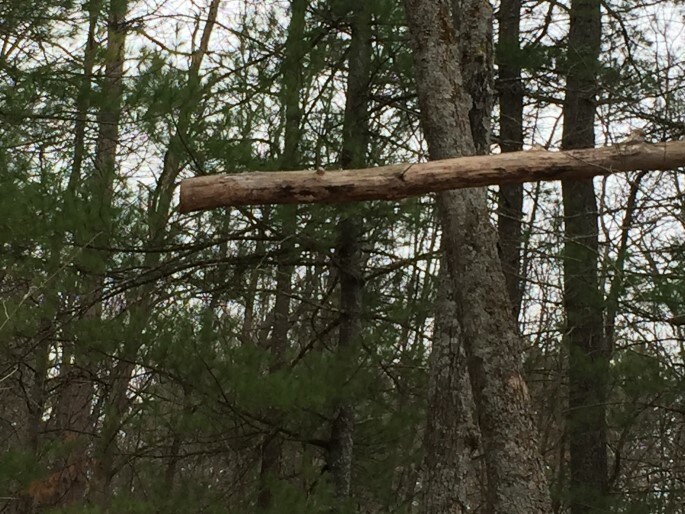 What I found was part of a tree suspended horizontal, up a ways in a tree, held up by these branches. 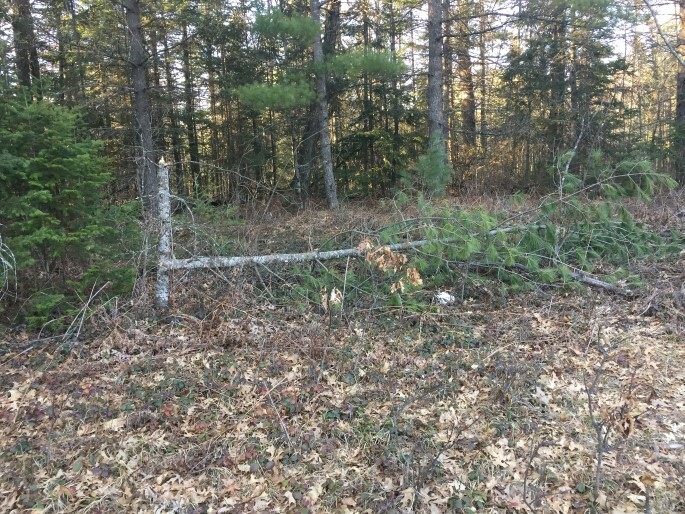 Now, I know what some may say, "Ok, so what..", but if you notice the tree is bigger than the branches holding it, so if it fell the weight & size should have broken those limbs, also if you look at the last picture, you see that it was cut by a chain saw. 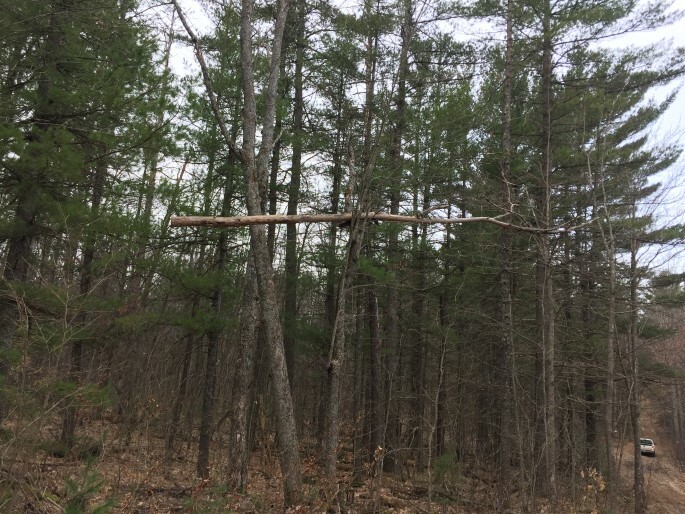 Now, my question is simple, "What type of individual would cut a tree down, only to hoist it back up into the air, setting it on a few tree limbs?" 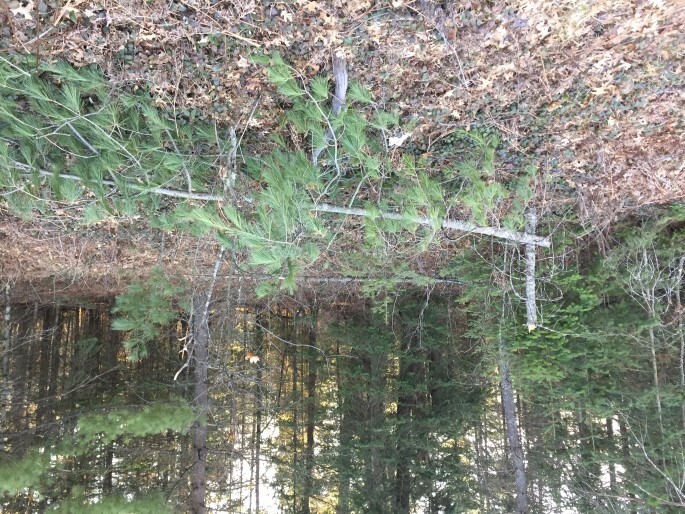 The second area is on the western side of "Dead Stream Swamp", which was designated as a National Natural Landmark in 1976 and is part of the Au Sable State Forest. 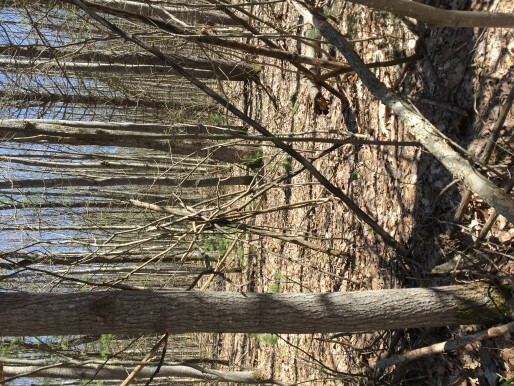 The 11,680 acre parcel according to Michigan DNR; "…is an exceptionally large example (one of the largest in the United States) of a northern white cedar swamp, considered to be the climax in bog forest development. Large white cedar swamps are disappearing, partially due to the demand for this timber product. Besides swamp forest, the Landmark contains approximately 800 acres of deciduous upland forest; shrubs and sedges bordering the lower reaches of Dead Stream; and the 60-acre Bear Lake, a bog pond bordered by an expansive sphagnum-heath mat." The other encounter occurred on the boarder of a swamp, with trees to the north and west and scrub/ bushes lining the two-track that lead to the clearing. 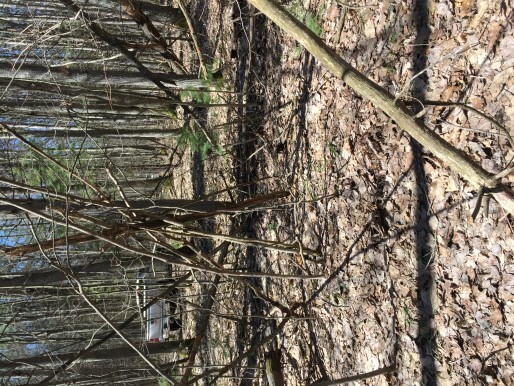 There are several trails to the north & northeast of the clearing that go off into the woods or into the swamp. 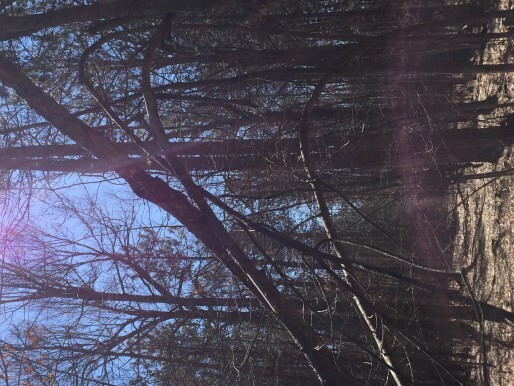 The witnesses second encounter occurred south of Higgins Lake, near an area that is called "Dead Stream Swamp". There was a two-track that went from the main road back towards and skirting the western edge of the swamp ending at a clearing that opened up to around a 150' in diameter. The witness stated that it was him, family and friends that were gathering for a party. There was a fire going and everyone was laughing, sitting around in chairs or at the picnic table that the witness brought. As the evening progressed, they started noticing sounds coming from the woods surrounding the clearing, breaking branches, vocalizations and what sounded like a tree crashing to the ground. They eventually saw a silhouette moving in the woods, west of the clearing and that prompted everyone to decide to leave. The witness, friends and family proceeded down the two-track towards the main road and came across a tree laying across their path. Several of the party-goers grabbed chainsaws, cut the tree up to move it, allowing everyone to eventually leave. The picnic table is still in the clearing, the witness currently has no intentions on retrieving it. The second experience was brought up by the witness at the tail end of the discussion we were having about his first encounter, afterwards he offered to take us to the spot, but wanted us to understand that when it starts getting dark, he wanted out of that area. Upon arrival, I noticed that the turn off he took was an easy one to miss if you're driving down the road & were not familiar with the area, but once on the two-track after about 10-20 feet, you lose sight of the road of the main road. The dirt path wound back and forth for several hundred yards, before coming out into the clearing with the swamp to the right, woods to the front & left. Upon exiting the vehicles, we walked around the clearing as the witness proceeded to explain the circumstances of the night. He pointed the directions out of the vocalizations, he showed us where they saw the silhouette of the creature walking in the woods (it was late day, and with the sun behind the trees, everything looked like a silhouette in that direction.) We walked into the woods on the northside of the clearing and found numerous trails leading northwards, to the east and also to the west. After searching the area, we (the witness and I) decided to follow one of the trails to the east where we encountered the swamp, with the trail continuing into it. 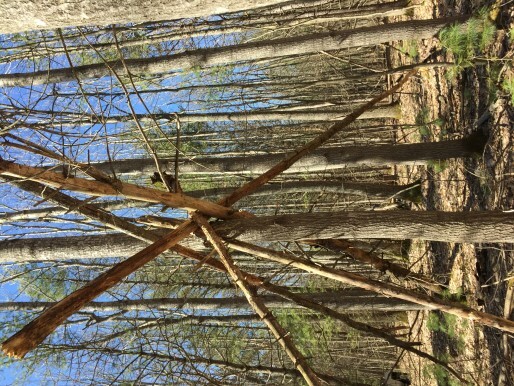 The stick structure is compelling along with its mini-me version, the many, many arches that can be seen throughout the woods makes you stop and wonder whether that many can be attributed to natural causes and then finding a tree cut near its base and suspended some 15' above ground by limbs that are smaller in diameter than the tree itself. As for the witness and his daughter, I found them to be credible in their statements. I do believe that they had an encounter with something that they believe was a sasquatch being followed by a wolf. There are 14 reports within a 30 mile radius of this report. This witness recently shared his encounters in person at the August 2018 UPBSRO Townhall Meeting. Richard is a designer for a power company that services the majority of Lower Michigan. He is a former Emergency Medical Technician & Volunteer Firefighter. He enjoys camping, hiking and Geocaching with his wife, kids and grandkids. He and his wife attended the 2012, 2013, 2015, 2016, and 2018 Michigan Upper Peninsula Expeditions.